Only one in 10 journalists surveyed by the Public Relations Global Network (PRGN) ranked the info sent by the company or its PR firm as the first source they use when conducting research before a CEO media interview. That means 90 percent of journalists are going somewhere else for their first research stop, and these other sources may help shape the story’s tone and content before the materials you provide can have an effect. Previous coverage by other media was the top choice for journalists surveyed, with 36.3 percent; followed by the company website with 20.4 percent; and Google with 17.7 percent. So, does that mean you shouldn’t bother with providing journalists solid background info before they interview your CEO? You definitely should provide info, as it is still among the top several most-often-turned-to sources for research … usually just after previous media coverage and the company website. Know what media coverage on your CEO and company is out there. Do a Google search yourself, and review previous media coverage, especially any negative coverage, from credible or popular media outlets. Use this coverage to help you identify and address any potential problem areas or hot issues. Look at the stories resulting from the reporter’s most recent CEO interviews. These can help you to see what the usual tone, topics and takeaways from such interviews are. These insights can be important in helping you CEO prepare for the interview, as well as in selecting what materials to provide the journalist in advance. Make sure your company website is current and that its key messaging aligns with your CEO’s current thinking and strategy. The journalist will often look to a company website to get some sense of how the company positions itself, and will search for cues and data that may shape some of the interview questions. So put these channels on your radar (if they’re not already) and monitor what your company’s and CEO’s channels are communicating to the world. Reporters typically put a lot of preparation into the interview despite their crazy, time-pressed schedules. So everything you can do to make their job easier will be appreciated. 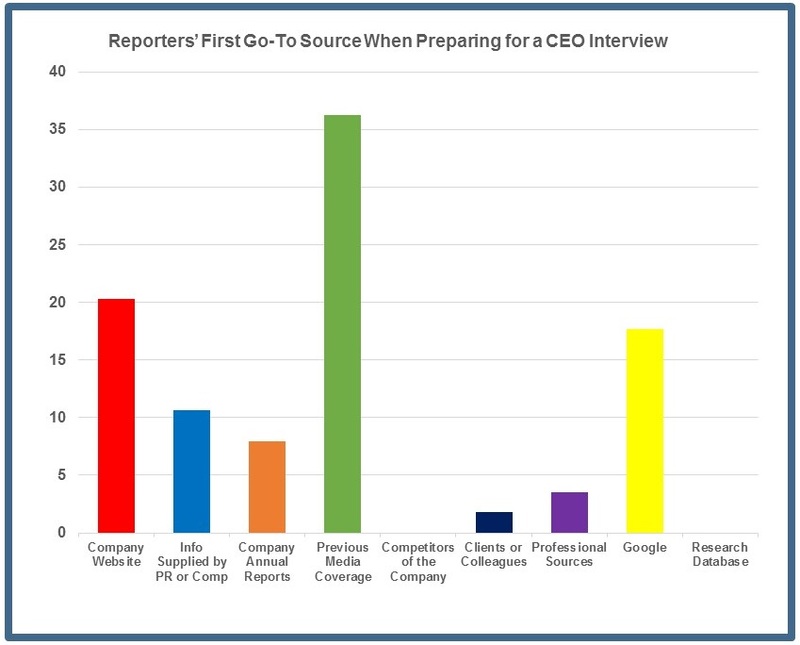 The PRGN journalist study surveyed more than 110 journalists from around the world to get insight on how media professionals prepare for and conduct interviews with CEOs, as well as to understand how their reporting duties and needs are changing. Click here for more info. Stay tuned for blog posts on CEO media interview mistakes #3 and #4. To see the post on CEO media interview mistake #1, click here http://bit.ly/2FWcR3j.